We cannot fault Pebbles childcare – they are amazing! Both our children love attending and Bridgit and Chloe are so warm , fun, caring and engaging with the children. The thought and planning they put into the children’s experiences and learning is outstanding. I love how they take into account the children’s personal interests when planning trips or activities. I also like that Pebbles provide food, and my two love the home-cooked meals. Chloe and Brigit always keep us informed of what they are doing and it’s great seeing pictures of the children having fun throughout the day. I feel like we have struck gold finding Pebbles; it’s great being part of the Pebbles family! Pebbles has given both of our children so many happy memories. Bridget and Chloe always go the extra mile to make every child feel special, nurturing their holistic development in a home from home environment. Pebbles is a part of our family! 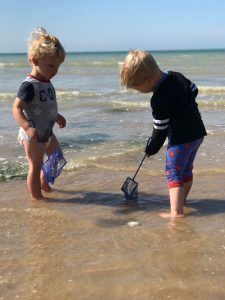 The wider Pebbles team of Billie, Ben, Tom, Luca, along with all the friends and family that are connected to Pebbles, provide a well rounded mix of social experiences that have helped Yasmin and Alexia gain both confidence and social skills. The wide range of activities and trips they take part in has developed a curiosity and sense of adventure in all they do. I say the best thing about Pebbles is Chloe’s banter. Fantastic, friendly setting with stimulating environment. Children are encouraged to explore and experience new things. The Pebbles team is friendly, caring and always go the extra mile. My two children love going there. They get very excited the day before going to Pebbles and can’t wait for the morning to come! Our daughter has grown and flourished during her time at Pebbles. This has undoubtedly been down to the amazing relationships that Chloe and Bridgit nurture between the children and themselves, it really does feel like one big family. We love that Florence is always out and about visiting new places that are adapted to tap into the interests of the children. Equally it is just lovely to see her curled up on the sofa under a blanket with her friends in Bridgit’s home. We feel incredibly lucky to have found and to be a part of the Pebbles family!